Engineers at the Sports Technology Institute (STI) at Loughborough University are helping to prepare students to work in the sports equipment industry. As a tennis racket manufacturer, how do you differentiate your products? The market is mature, there is little difference between your racket and your competitors and there are strict rules about the product specification, which restrain radical performance enhancement. Customer preference is not just based on performance but on other factors; such as habit, comfort and the all-important ‘feel’ of the product. But how do you turn these subjective judgements into something useful to incorporate into your design? The answer is with engineering analysis, logical data interpretation and an understanding of the athlete. The Sports Technology Institute (STI) at Loughborough University has been working with HEAD Sport to help them develop their products. Tennis players want a particular “sound” when they hit the ball, which conveys “quality” and improves the “feel” of the racket, however, the sound is often the by-product of a design process focussed on racket performance. HEAD engineers had collected a lot of data on the sounds but found it difficult to interpret the data meaningfully. So the STI investigated how rackets vibrate, using experimental modal analysis, and then looked at how the vibration frequencies relate to sound from an impact. They finally had to link the user perception of the noise, which differs between people, to what was actually happening. They could then help HEAD to engineer good sound quality into the product at an early stage of the design process. The Sports Technology Institute combines traditional engineering (such as design, materials, manufacturing, simulation and measurement) with sports science (biomechanics and kinesiology). It prepares its students to work in the sports equipment industry; covering balls, clothing, footwear, monitoring technology and protective equipment. It crucially looks at how the athletes use the equipment and the impact that design has. When research into Sports Technology began at Loughborough, the sports equipment sector was largely unaware of the benefits that modern engineering practice could have on their businesses and products. Formula 1 racing has led the way, and is now considered a jewel in the British engineering crown. F1 has established itself as a sport where technology, innovation and continuous evolution of the rules run hand in hand. Followers of the sport will appreciate that, whilst the winning driver receives the glory, the role of the team is crucial; from the pit-crew to the aerodynamicists and the engine design team. McLaren Applied Technologies has chosen to harness the knowledge and brand value of their F1 operation to benefit other sports. They have ambitious plans to extend the hi-tech end of the sports equipment sector, driving performance gains through advanced simulations and data-driven design. Already they have seen notable successes in delivering medals at the London Olympics through their partnership with UK Sport and in the creation of Mark Cavendish’s world Championship winning bicycle with the US cycling company Specialized. Over the last few years, the general public has become much more knowledgeable about technology in sports. As debate on racing car design, goal line technology for football and running track design became widespread in the media, the public fascination for understanding the contribution of technology to sporting success has grown. This was further fuelled by the 2012 London Olympic and Paralympic Games. The discerning British sports fan will now, not only take a view on the performance of an athlete, but also consider the influence of their equipment, clothing and footwear, and its legitimacy within a framework of rules that have often struggled to keep up with the pace of technological change. Even sports considered to be more conservative, such as cricket, have benefited from a wide range of technical innovations. The use of advanced motion tracking of elite fast bowlers allows coaches and medics to manage the health and performance of their players. The evolution of the protective helmet illustrates the complexity of the interaction between sporting performance, rules and technological development. Protective headwear in cricket was first introduced in the 1970s to combat the increasing level of cranial and facial injuries. Modern cricket helmets consist of three main parts; the shell and the liner which work together to distribute the impact forces over a large area, and the faceguard which is intended to prevent ball contact with the face. Despite cricket helmets now being commonplace, injuries remain prevalent in the professional game, with almost a quarter of all cricketing injuries occurring to the head where wearers might expect to be protected. The majority of injuries are due to the ball breaching the gap between the peak and the faceguard or the faceguard being forced onto the face. But currently neither of these eventualities are required to be tested in order for the helmet to adhere to the relevant standards. Enhancing the helmet test standards to include a specific procedure that identifies whether or not the ball passes between the peak and the faceguard should lead to helmet design improvements. 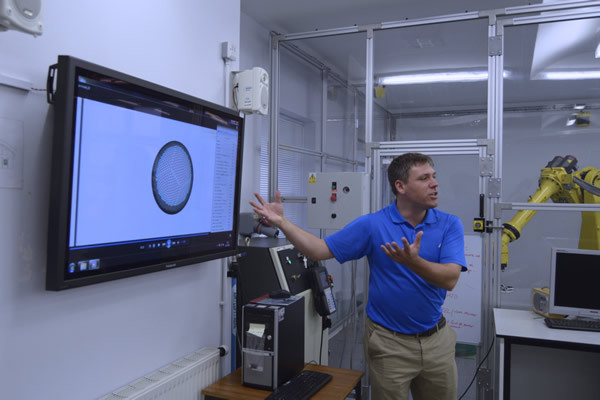 Experimental studies recently conducted at Loughborough University’s Sports Technology Institute have supported the International Cricket Council with the development of a proposed revised test standard and investigated how current products fare against it. This case study is typical of the research and development activities that the Sports Technology Institute at Loughborough University is involved with. In parallel with the development of the new test standard, dissemination of new knowledge has been provided to all members of the panel, representing national and international governing bodies, professional player associations and a wide range of leading manufacturers. All the partners share a common ambition to ensure that players are afforded the highest levels of protection without compromising their comfort or ability to perform. The years ahead look set to be characterised by an ongoing demand for more technology and innovation in sport, and the UK is well placed to play a leading role. It has a significant percentage of the world’s academic groups studying sports technology and engineering. University groups at Loughborough, Sheffield Hallam, Southampton and Ulster are actively engaged in sports engineering research and education, either to benefit a commercial or governing body partner directly, or as a vehicle for broadening understanding. At Loughborough, the research work is also used for teaching, as relevant case studies ensure the content of the degree is up to date, interesting and really inspires the students. Laboratory sessions and project work are often closely aligned with current research programmes. Jon Roberts reflects that when potential students come and visit: “they really like what they see, and what to get involved”. The Sports Technology graduates are now conducting their own cutting edge research within universities, or being employed by sports equipment industry, independent test centres, governing bodies and national sports federations. The more entrepreneurial have established their own companies such as TartyBikes, Progressive Sports and Inspired Bicycles, where they have a chance to put their unique skill set to work in their own business. Looking to the future, as the value of elite athletes continues to grow increasing attention will be given to the efficiency with which athletes are “produced”. Advanced training and conditioning systems will continue to play an important role, but an increasingly scientific approach will be taken to talent identification and development in junior athletes. The ability of technological systems to measure beyond the obvious physical attributes and support this activity looks set to provide an exciting platform for innovation and performance gains. The study of these factors is already happening within the universities, as sports performance analysis becomes personalised and focused on the individual.